IT and OT – though they are two different things, the previous tendency to “divide and conquer” when it came to strategy, management and solutions is going away. When it comes to IT and OT, their worlds are colliding inside data centers. Operating as two separate entities without communication and collaboration is not effective, efficient or ideal. Though not all data centers are operating with IT/OT convergence, the transition has begun – IT/OT convergence is already happening in healthcare, energy, aviation, manufacturing, transportation, defense, mining, oil and gas, utilities, natural resources sectors, and more – and it is only a matter of time until it is simply the data center industry standard. OT (operational technology) has a few primary focuses – maximizing uptime, ensuring the proper function of equipment and infrastructure, and the security and availability of operational assets and processes. OT is a blend of both hardware and software so that environmental maintenance can occur. Though some are not even familiar with the name “OT,” OT is essential to the day-to-day operations of a data center. 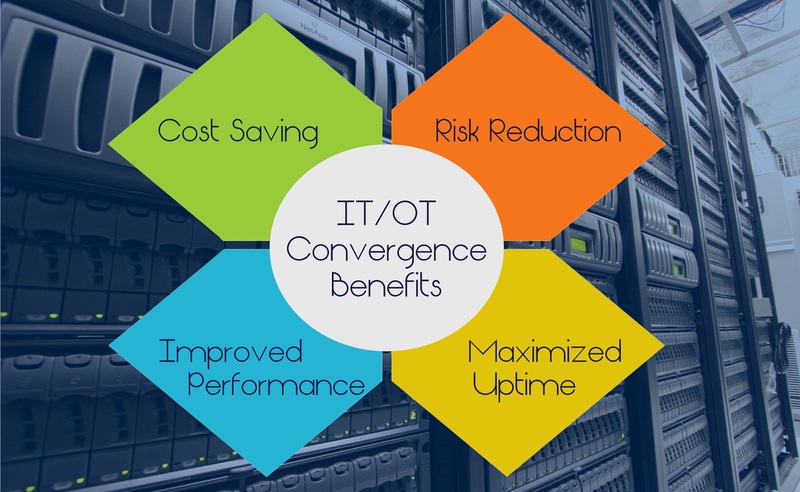 The convergence of IT and OT is happening because the specific technology involved in operational technology (such as communications, software and security) is evolving and OT is integrating more information technology (IT) into their operations. When you integrate infrastructure management systems, your data center information will be able to flow between departments with ease. Data from IT can and should be an indispensable tool in providing the information OT needs to formulate strategy and make decisions. The result will be increased productivity, improved efficiency, decreased downtime, and enhanced security. With integration, knowing what your data center needs will be timely and accurate, making effective maintenance far easier. Your RTOI will be accurate so, should you need to make a quick adjustment – whether large or small – you will hopefully know before you experience any problems or catastrophic events. With any changes in data centers, there are growing pains. Logistical intricacies to fine tune. Security challenges. There will always be a list of challenges in implementing change. But, the convergence of information technology and operational technology is a value-added change. The specific values will vary amongst industries but, make no mistake, convergence will have a payoff. Though there will be challenges in converging IT and OT, success is very achievable with thorough planning, proper execution and full implementation of an IT/OT strategy. All data center team members must be fully educated and on board to be properly prepared for the change. Make no mistake; IT and OT are not the same. Though they are converging they are different and separate yet, joint structures. If a harmony and alignment of strategies can be found, IT and OT convergence can be a stunning success. By converging IT and OT, there will be similar technology and this overlap of sorts will allow the two to work together synergistically. This will be beneficial in a variety of ways but one of the most prominent ways is that it will be cost-saving. Not only because costly downtime will be reduced but because IT and OT teams can, in some ways, be combined and redundant team members pruned for efficiency. In addition to this, convergence will provide risk reduction because there will be an overlap of security issues and those issues will be able to be simultaneously addressed. And, perhaps most significantly, data centers will enjoy enhance performance from IT/OT integration. Bad redundancies (such as similar but separate operations that could be under one umbrella) and good redundancies (such as finding ways in which IT and OT can synergistically work together) enhanced. Further, convergence will improve performance in the form of enhanced system availability. Better performance that will mean more uptime because of a reduced risk of things like cyber-attack, poor infrastructure management, power failure and more. Through a collaborative effort, a focus on future technologies, a drive toward maximizing uptime and minimizing security risk, and a desire for improved efficiency, data centers will successfully achieve IT/OT convergence and step into the future of data centers. This entry was posted in Data Center Design, data center equipment, Data Center Infrastructure Management, data center maintenance, Data Center Security, Datacenter Design, DCIM, Hyper Converged Infrastructure, Power Management and tagged compute room construction, computer room design, Data Center, data center design, data center equipment, data center maintenance, Emergency Power Systems. Bookmark the permalink.